This paper deals with a viscoelastic beam obeying a fractional differentiation constitutive law. The governing equation is derived from the viscoelastic material model. The equation of motion is solved by using the method of multiple scales. 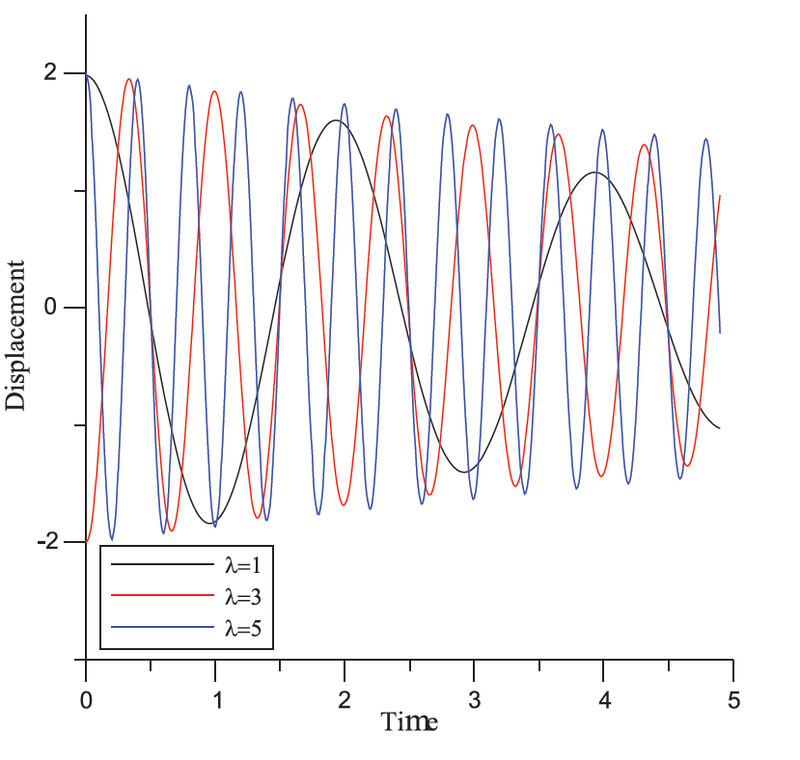 Additionally, principal parametric resonances are investigated in detail. The stability boundaries are also analytically determined from the solvability condition. It is concluded that the order and the coefficient of the fractional derivative have significant effect on the natural frequency and the amplitude of vibrations. Many researchers have demonstrated the potential of viscoelastic materials to improve the dynamics of fractionally damped structures. Fractional derivatives are practically used in the field of engineering for describing viscoelastic features in structural dynamics . Namely, linear or non-linear vibrations of axially moving beams have been studied extensively by many researchers . Fractional derivatives are used in the simplest viscoelastic models for some standard linear solid. 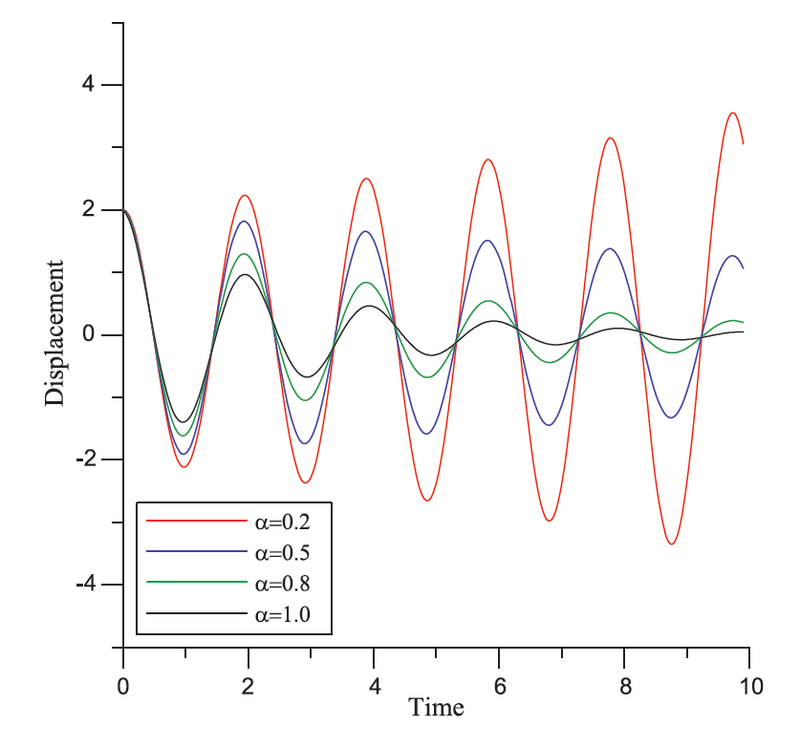 It can be seen that the vibrations of the continuum are modeled in the form of a partial differential equation system . 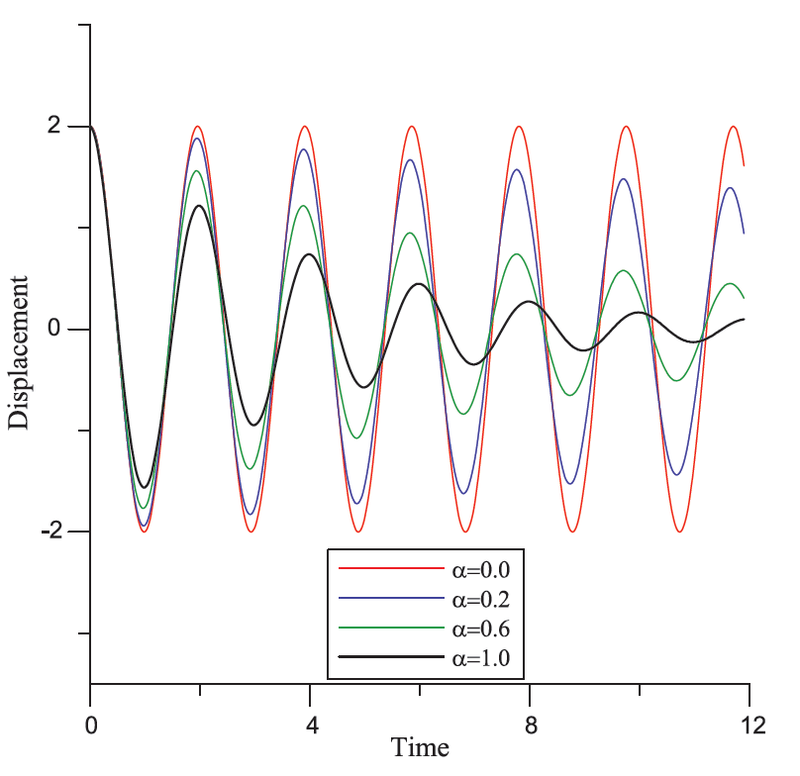 These damping models involve ordinary integer differential operators that are relatively easy to manipulate . On the other hand, fractional derivatives have more advantages in comparison with classical integer-order models . The partial differential equations of fractional order are increasingly used to model problems in the continuum and other areas of application. The field of fractional calculus is of importance in various disciplines such as science, engineering, and pure and applied mathematics . The numerical solution for the time fractional partial differential equations subject to the initial-boundary value is introduced by Podlubny . The finite difference method for a fractional partial differential equation is presented by Zhang . Galucio et al. developed a finite element formulation of the fractional derivative viscoelastic model . Chen et al. studied the transient responses of an axially accelerating viscoelastic string constituted by the fractional differentiation law . Applications of the method of multiple scales to partial differential systems arising in non-linear vibrations of continuous systems were considered by Boyacı and Pakdemirli . The method of multiple scales is one of the most common perturbation methods used to investigate approximate analytical solutions of dynamical systems. The dynamic response of the continuum is analyzed by using this method. In this paper, longitudinal vibrations of the beam with external harmonic force are studied. The model developed is used to show the applicability of the fractional damped model and to find an approximate solution of the problem. The Riemann-Liouville fractional operator is emphasized among several definitions of a fractional operator [10, 11]. On the other hand, the approximate solution of the beam modeled by a fractional derivative is obtained and an application of the fractional damped model is also given. 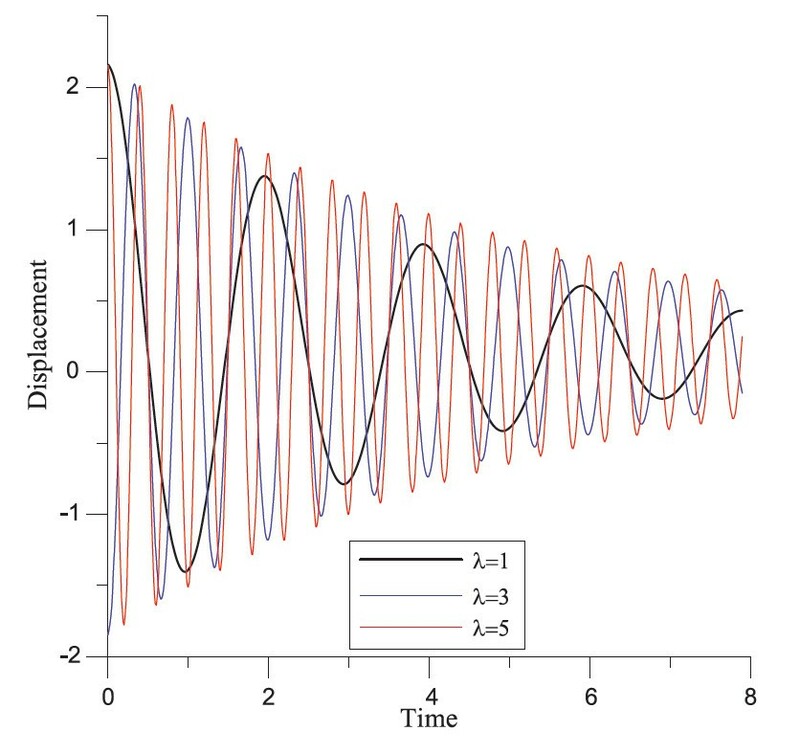 Additionally, the effects of a fractional damping term on a dynamical system are investigated. Finally, it is seen that the fractional derivative also has an effect on damping as a result of the previous studies in the literature. w ( 0 , t ) = w ( 1 , t ) = 0 . D 0 2 w 1 + L 0 [ w 1 ] = [ − 2 i ω n D 1 A n e i ω n T 0 + 2 i ω n D 1 A ¯ n e − i ω n T 0 ] X n ( x ) + a 2 X n ″ [ A n ( e i ( ω n + Ω 1 ) T 0 + e i ( ω n − Ω 1 ) T 0 ) + A ¯ n ( e − i ( ω n − Ω 1 ) T 0 + e − i ( ω n + Ω 1 ) T 0 ) ] + a 2 Y ″ [ e i ( Ω 1 + Ω 2 ) T 0 + e − i ( Ω 1 + Ω 2 ) T 0 + e i ( Ω 1 − Ω 2 ) T 0 + e − i ( Ω 1 − Ω 2 ) T 0 ] − η X n [ ( i ω n ) α A n e i ω n T 0 + ( − i ω n ) α A ¯ n e − i ω n T 0 ] − η Y [ ( i Ω 2 ) α e i Ω 2 T 0 + ( − i Ω 2 ) α e − i Ω 2 T 0 ] . Thus, different cases arise depending on the numerical value of variation frequency. These cases will be treated in the following sections. In this section, we assume that one dominant mode of vibrations exists. As a result of the previous studies in the literature, it is seen that the results are the same in the finite mode analysis and in the infinite mode analysis [3, 14]. Therefore, we consider one dominant mode of vibration in this study. φ n ( 0 ) = 0 , φ n ( 1 ) = 0 .
d 1 = ∫ 0 1 X n ( x ) X n ″ ( x ) d x .
ω n a = − a 2 ω n σ n sin ( σ n ε t ) ∫ 0 1 X n X n ″ d x + η 2 ε t ω n α − 1 cos ( π 2 α ) . 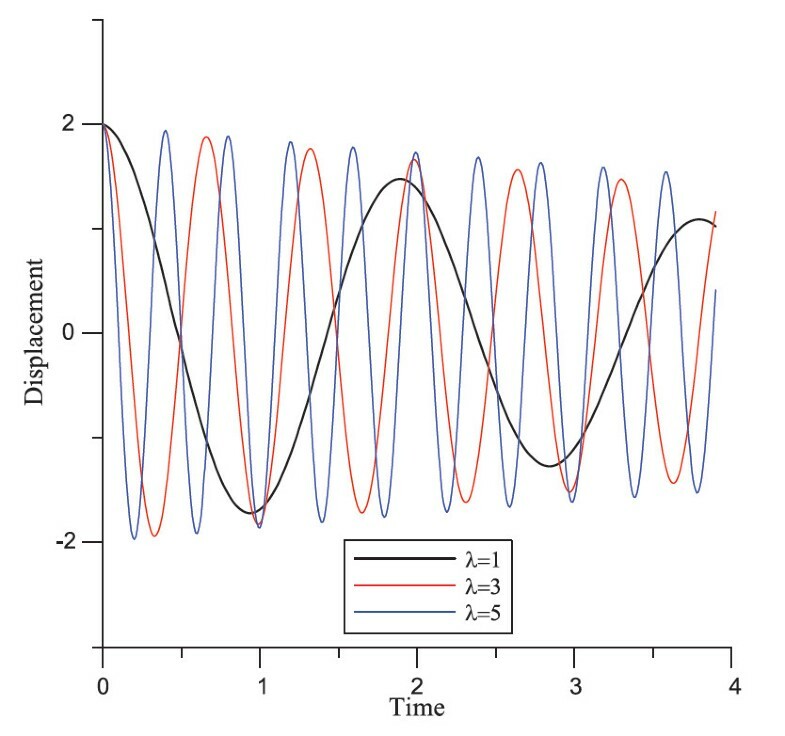 As seen in Figure 1, the fractional derivative α-order has an effect on the displacement-time curves. In Figure 2 and Figure 3, the effect of the variation of the coefficient λ is observed for the different functions on displacement-time curves. Displacement-time curves for different values of the order of the fractional derivative for f ( x ) = x e − x ( a = 0.8 , ε = 0.1 , η = 8 , λ = 1 , x = 0.5 ). Displacement-time graph for different values of λ for f ( x ) = x e − x ( a = 0.5 , ε = 0.1 , η = 8 , α = 0.6 , x = 0.5 ). Displacement-time graph for various values of λ for f ( x ) = x 2 e − x ( a = 0.001 , ε = 0.1 , η = 8 , α = 0.8 , x = 0.5 ). Ω 1 = 2 ω n + ε σ n .
B n ( T 1 ) = ( b n R + i b n I ) e λ T 1 . [ λ + η 2 ω n α − 1 sin ( π 2 α ) − d 1 4 ω n + ( η 2 ω n α − 1 cos ( π 2 α ) − σ n 2 ) − d 1 4 ω n − ( η 2 ω n α − 1 cos ( π 2 α ) − σ n 2 ) λ + η 2 ω n α − 1 sin ( π 2 α ) ] [ b n R b n I ] = [ 0 0 ] . [ λ + η 2 ω n α − 1 sin ( π 2 α ) ] 2 − [ ( d 1 4 ω n ) 2 − ( η 2 ω n α − 1 cos ( π 2 α ) − σ n 2 ) 2 ] = 0 .
σ n = η ω n α − 1 cos ( π 2 α ) ± ( d 1 2 ω n ) 2 − ( η ω n α − 1 sin ( π 2 α ) ) 2 .
for the external excitation frequency. Thus, the two different values of Ω 1 denote the stability boundaries for small ε. Additionally, it is seen that the stability boundaries depend not only on natural frequency but also on α. The variation of an unstable region for different values of λ is observed in Figure 4. 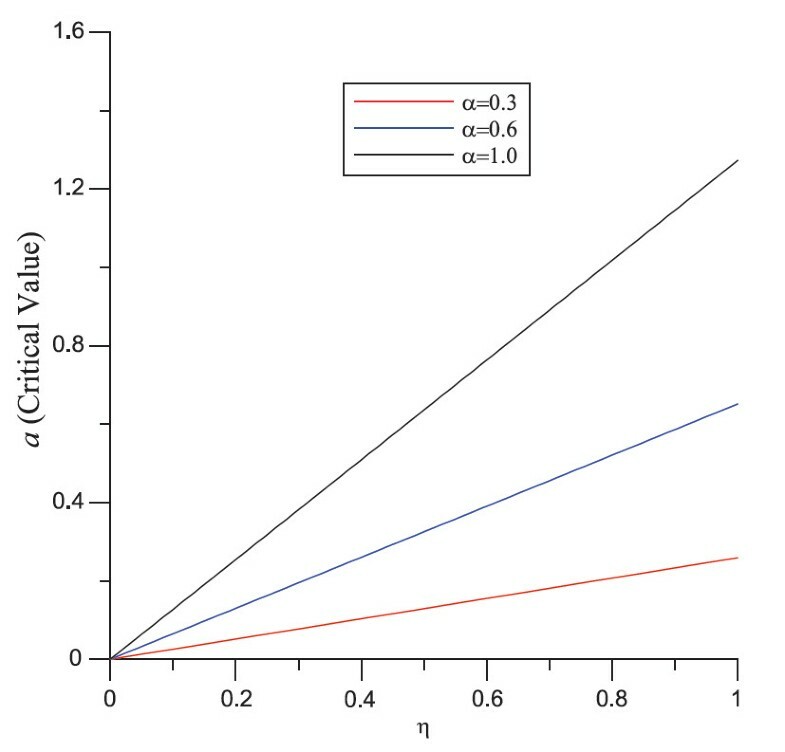 Since the rigidity of the system is increased by decreasing the value of λ, the unstable region reduces expeditiously for smaller values of λ. Stability boundaries for different values of λ for f ( x ) = x e − x ( α = 0.5 , η = 5 ). The variation of an unstable region with some different values of α for λ = 5 and η = 5 is shown in Figure 5. 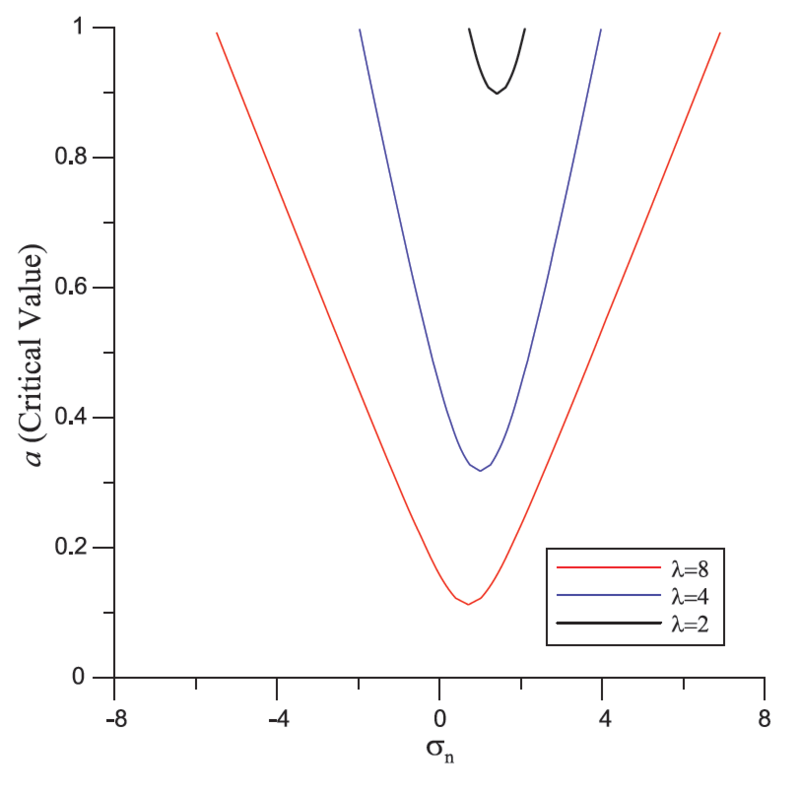 Here, it is expected that the critical value of a becomes zero for α = 0 . This situation is clearly observed in Figure 5. On the other hand, the unstable region diminishes while α is increasing. 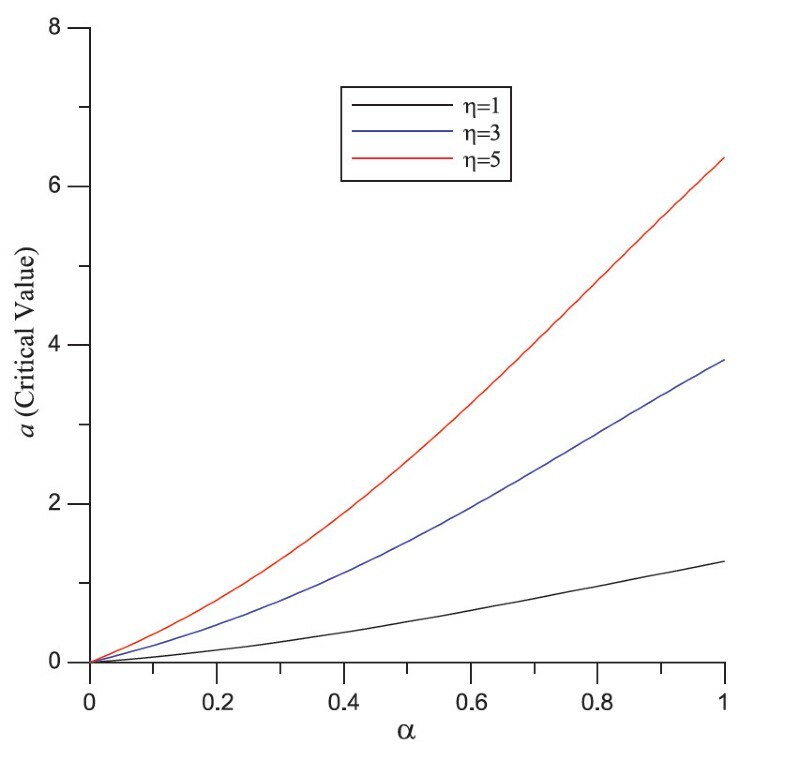 Finally, the effect of the variation of α on the critical value of a is presented in Figure 6. Figure 7 shows that critical value a changes nonlinearly with the order of fractional derivative. Stability boundaries for different values of α for f ( x ) = x e − x ( λ = 5 , η = 5 ). Critical value of a versus the value of η for various fractional orders ( λ = 1 ). Critical value of a versus the value of α for various damping coefficients ( λ = 1 ). φ n ( 0 ) = φ n ( 1 ) = 0 . 2 i ω n D 1 A n ∫ 0 1 X n 2 ( x ) d x + η ( i ω n ) α A n ∫ 0 1 X n 2 ( x ) d x = 0 . 2 i ω n D 1 A n + ( i ω n ) α d 1 A n = 0 .
w ( x , t ) ≅ A 0 exp ( − η 2 ω n α − 1 sin ( π 2 α ) ε t ) × [ exp ( i η 2 ε t ω n α − 1 cos ( π 2 α ) + i ω n t ) + cc ] sin ω n x + 2 cos Ω ¯ 2 t [ sin Ω ¯ 2 x sin Ω ¯ 2 [ ψ ( 0 ) cos Ω ¯ 2 − ψ ( 1 ) ] − ψ ( 0 ) cos Ω ¯ 2 x + ψ ( x ) ] . A n ( T 1 ) = A 0 exp ( [ i 2 ω n α − 1 η cos ( π 2 α ) − η 2 ω n α − 1 sin ( π 2 α ) ] T 1 ) . 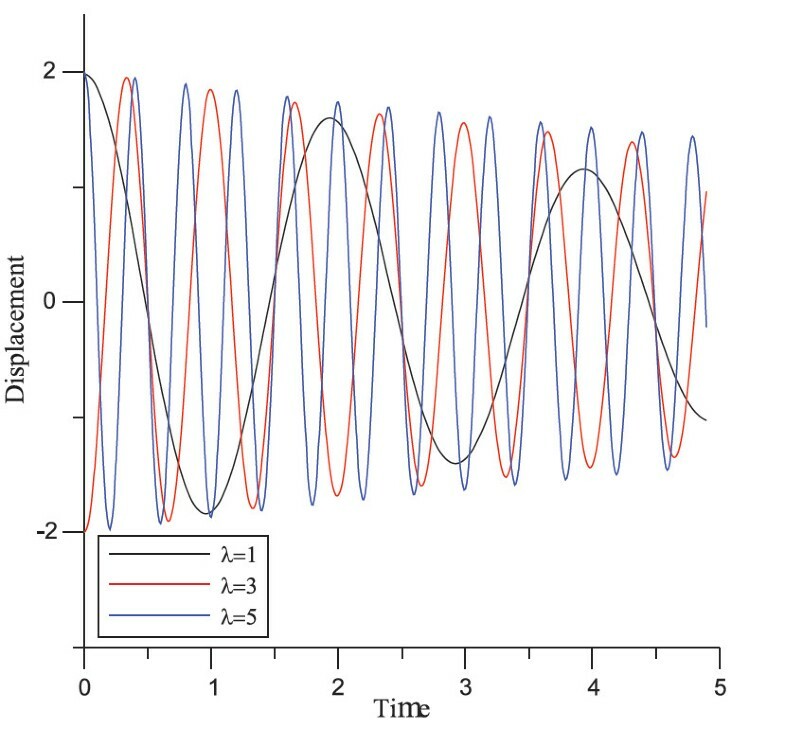 The displacement-time variation for different values of α is seen in Figure 8. Also, it is shown that the damping increases while the value of coefficient λ diminishes in Figure 9. Displacement-time graph for the different fractional order for f ( x ) = x e − x ( ε = 0.1 , λ = 1 , η = 5 , x = 0.5 ). Displacement-time graph for different values of λ for f ( x ) = x e − x ( ε = 0.1 , η = 8 , α = 0.5 , x = 0.5 ). σ n = η 2 ω n α − 1 cos ( π 2 α ) ± η d 2 2 ω n 2 α − 2 a n 2 − ( 1 2 ω n α − 1 sin ( π 2 α ) ) 2 .
d 3 = − a ∫ 0 1 X n ( x ) Y ( x ) d x .
σ n = η 2 ω n α − 1 cos ( π 2 α ) ± 1 2 d 3 2 ω n 2 a n 2 − η 2 ω n 2 α − 2 sin 2 ( π 2 α ) . 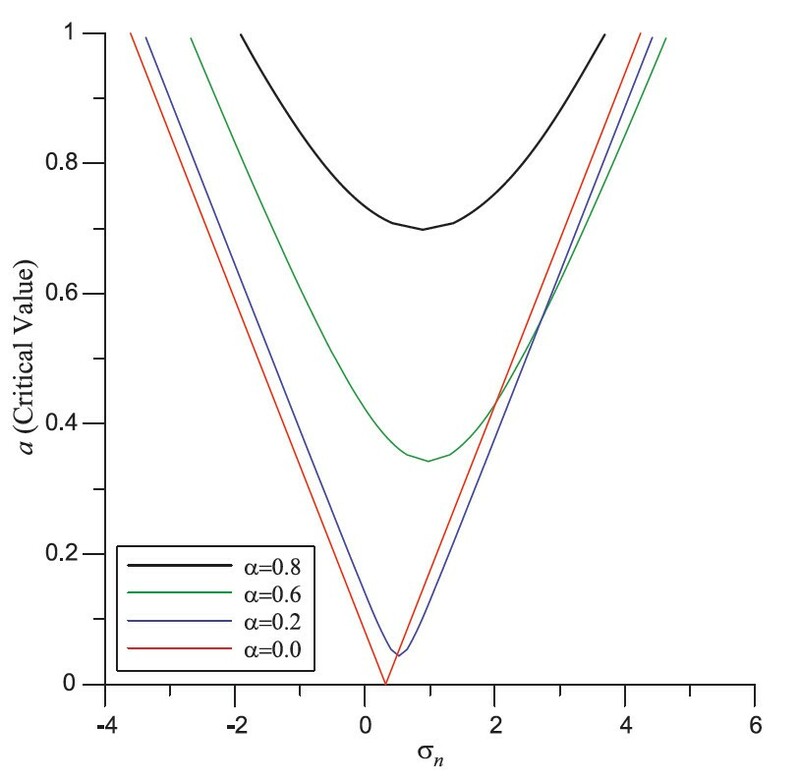 In this study, the effects of the damping term modeled with a fractional derivative on the dynamic analysis of a beam having viscoelastic properties subject to the harmonic external force are investigated. The parametric or primary resonances in simple supported beams, the governing equation of which involves a fractional derivative, are also analyzed. 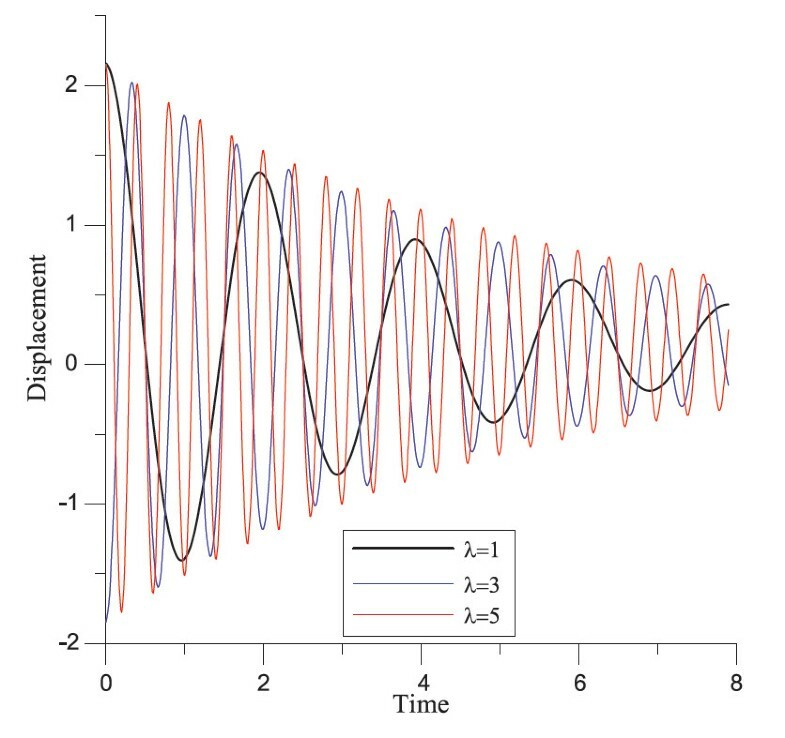 It is concluded that the value of the natural frequency of the beam modeled with a fractional damper is greater than that of the beam modeled with a classical damper. The fractional derivative has no effect on the static behavior, but it has a significant impact on the dynamic behavior. Furthermore, it is seen that the unstable region in the resonance case diminishes when the order of the fractional derivative increases.